Mr Sood was asked to write an article for Arthritis Today Magazine to inform its readers about revision hip replacement surgery. The article addresses common questions that patients ask about revision hip replacement including reasons for revision, a brief outline of what is done at revision hip surgery and outcomes from revision hip surgery. The full-text of the article appears below. To read the article in the magazine, please click here. The magazine will open and the article starts on page 15. We hope that you find the article informative. Total hip replacements (THRs) are performed when hip joints become arthritic and significantly painful. They are very successful procedures, however, they will eventually wear out and in some cases complications may develop, requiring a further operation, called a revision (or re-do) hip replacement. Orthopaedic surgeon Manoj Sood gives an overview of this procedure. A revision or “re-do” total hip replacement procedure involves the removal of the existing THR and its replacement with new components. 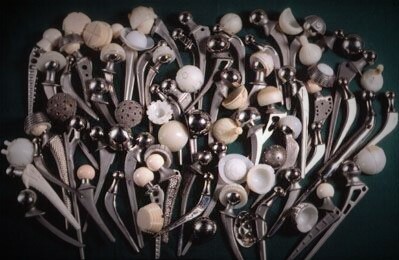 A hip replacement consists of a stem, a head and a socket. Sometimes only the socket or stem requires replacement, but at other times the whole THR is removed and replaced. This is complex surgery, but is required in certain situations where the existing THR is not functioning satisfactorily or has become painful or infected. How common is this type of surgery? Last year over 80,000 THRs were performed in the UK. More than 1 in 10 of these (approximately 8,600) were revision THRs. There is evidence that the number of revision THR procedures performed in the UK is increasing. What are the reasons for needing a revision THR? The THR may have become painful because it has been in place for many years and the components have begun to wear and loosen, moving a little in the bone. This type of loosening usually causes some bone loss and damage, and this bone loss needs to be dealt with at the time of revision surgery. THRs can dislocate on repeated occasions and revision surgery may be needed to stop this distressing complication from happening. Patients may fall and sustain a fracture of the bone around the THR, called a peri-prosthetic fracture, and this can require a revision THR. A deep infection may develop in a THR, and, if this occurs, revision surgery will frequently be required to eradicate the infection and to implant new non-infected components. A single operation may be performed to eradicate the infection (single stage revision), but often surgeons prefer to do a two-stage revision involving two separate operations (see below). How long does a revision THR operation take to do? The exact time taken depends on the complexity of the individual case, as all cases are different; however it takes at least twice as long to do a revision THR as it does to do a first time THR. This means that it takes a minimum of 2-3 hours and significantly longer in more complex cases. It is specialist surgery requiring the use of specialist techniques and specialist equipment. What preparations are necessary before revision THR surgery? Preparations start some time before the day of surgery as it is essential that the surgeon plans the surgery very carefully. I plan all my revision THR procedures some weeks in advance and this includes computerised templating of every case. Sometimes specialist equipment is required and this is arranged in advance. My anaesthetist carefully assesses and prepares the patient for what will be major surgery. What happens during revision THR surgery? Usually a larger incision and specialised approaches to the hip joint are required to gain adequate access to perform the surgery. The Revision THR operation then involves three phases. The first phase involves the careful removal of the appropriate THR components whilst causing minimal damage to the bone that contains them. This requires special equipment. If the cement needs to be removed I commonly use an ultrasonic machine that “melts” the cement so that it can be safely removed. The second phase involves replacing any bone lost (see above) either with bone graft or using special porous metal augments (specialised building blocks) to create a solid foundation for the new THR. The third and last phase involves placing the new THR. If a deeply infected THR is being revised, this is commonly done as a two-stage process. The first stage operation involves removing the infected THR and placing a temporary hip replacement called a spacer. This spacer often contains antibiotics within it to help fight the infection. Once the infection has been cleared, a second operation is performed to place a new non-infected THR. Using this approach, it is possible to eradicate the infection in 80-90% of cases. Both uncemented and cemented implants can be used for revision THR’s although my preference, in the majority of cases, is to use uncemented components. What are the outcomes after revision THR? A vast majority of my patients can put full weight on the revised THR, with crutches for support, within 48 hours of surgery. A very small number need to put partial weight only on the operated leg for 6 weeks. A number are given a brace to wear for six weeks, usually if the revision THR was performed because the hip was recurrently dislocating. A successful revision THR offers relief from the symptoms that necessitated the procedure. Revision THR is a more complicated procedure than a first time THR, and so the risks of the procedure are higher. However, when performed by a surgeon who is specially trained to perform this type of surgery, and who does it regularly, the outcomes should be good in a vast majority of patients. The pain of a loosened THR, the unpredictability of an unstable THR that dislocates repeatedly and the painful deep infection of a THR can be cured in a vast majority of patients. How many times can a THR be redone? The truth is that there is no limit to the number of times a THR can be revised. Clearly, however, multiple revision procedures are not desirable as the more times a hip is revised, the more scar tissue is created in muscle and this can cause limping and loss of function. In addition, the risk of infection after the procedure increases the more times a hip is operated upon. With modern THR techniques, we expect well performed THRs using proven prostheses to last a minimum of 10-15 years, even in active individuals, before revision THR is required. The younger the patient is at the time of their first THR, the more likely they are to wear out their THR and require revision surgery. Hence the drive to use harder wearing THRs and to implant THRs that are smaller so that they are theoretically easier to remove if a revision THR is needed. How can the number of revision THR procedures needed be reduced? The key to this is to make THR’s last as long as possible, mainly by improving the “bearing surface” which is the part that wears and generates debris that causes loosening, which I discussed in more detail in the article in Arthritis Today 157. It is also vital that poorly performing THR prostheses (those that fail early) are identified as soon as possible so that their use can be curtailed. It is also important that high standards are practised during THR surgery to minimise the risks of complications such as dislocation, due to poorly-placed components, and infection. Developments continue in the field of revision THR. Some are aimed at reducing the complications that require a THR to be performed, and others are directed at improving the techniques, equipment and implants that are used in revision THR procedures. What is clear is that although revision THR is major surgery, modern revision THR performed by specialists in this field is a predictable procedure that can give reliably excellent results, provided that complications don’t occur. The risk of such complications is higher than in first time THR procedures and careful counselling of the patient is required before any revision THR procedure, so that the specific risks can be explained in detail. Manoj Sood is a Consultant Orthopaedic Surgeon and a Hip & Knee Specialist. 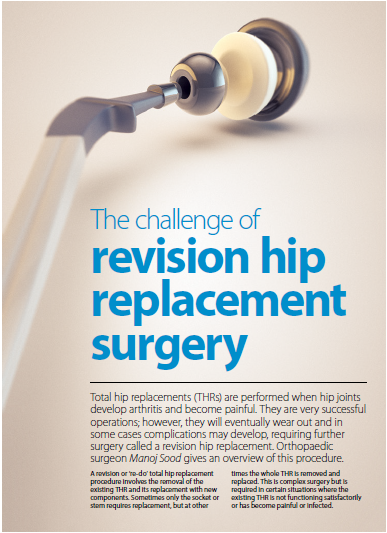 Arthritis Research UK’s booklet on hip replacement is available at 0300 790 0400 or enquiries@arthritisresearchuk.org.